The Rosena Ranch Circuit Race Pro 1/2 race had a slightly smaller field than last year with teams splitting up to do both the Chico Stage Race and Rosena Ranch Circuit Race. The Rosena Ranch Circuit Race is a deceivingly hard race as it has undulating terrain with windy sections along the whole course, which can make for a rough day. Most teams had no more than four riders, so this was going to make it a hard race to control. Luke Ollett along with another rider started the action out with an early attack going in the second lap of a 30 lap race. After the first move was absorbed, other attacks would come shortly after. With the race still early in the laps a couple of two man groups decided to go for a mega long move as the two man groups came together to make a four man team time trial group including Jose Reyes Garcia (OSI Bike Team), Chase Goldstein (The Weather Channel/Specialized) Joshua Stockinger (Monster Media) and Omar Andres Garcia (OSI Bike Team). This group would hold up until the end of the race. Another small group of four broke away later on in the race and tried to close the gap. As the gap shrank, it took it’s toll on the chasing four. With head buried for much of the race, the chase group would become only two riders including Leo Bugtai (SoCalCycling.com Team) and Eric Sobey. Then, with the closing laps another larger chase group formed with six to seven riders that would try hard to make up ground on the lead groups. With the break holding a comfortable lead on the chasing two riders, the break started to attack each other. This gave the advantage to OSI Bike Team riders as they had two riders in the break and they made the move to soften up the other two riders in the break as they had to bring back Omar’s attack and Jose (OSI Bike Team) got to rest up for the sprint. which came down to the four riders with Jose Reyes Garcia (OSI Bike Team) taking the sprint easily from Chase Goldstein (The Weather Channel/Specialized). Josh Stockinger rolled in for third with Omar Andres Garcia (OSI Bike Team) taking fourth. 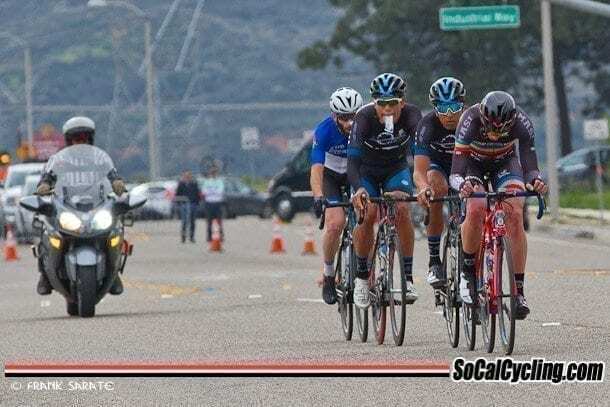 The two man chase group was roughly a minute back with Leo Bugtai (SoCalCycling.com Team) and Eric Sobey. Then with the closing laps the larger chase group with six to seven riders held off the field and sprinted for the remaining days placings.